Tap Next area to cycle dial colors. Tap Left LCD display to cycle LCD time modes. Modes are - 24 hr, 12 hr, Date, Stopwatch, Current Temp, Current Condition, Todays Hi, Todays Lo, UTC, TZ1, TZ2, and TZ3. In Stopwatch mode tap phone battery area to start/stop and watch battery area to reset. Tap Light area to cycle dim modes. Default is On Normal. 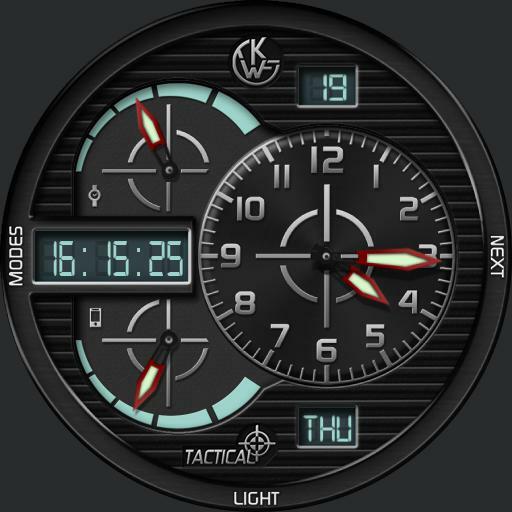 Tap 12 area on analog dial to cycle lume colors blue, green and multi. Ucolor is used for the digital text, battery markers and LCD panel tinting.